Dali's double image of theBust of Voltaire by Houdon has been use many times in various paintings and publications to illustrate the time - space concept. Dali did a guache of this figure as a picture puzzle. Scientific American magazine in the December 1971 issue used a detail from the Slave Market with Disappearing Bust of Voltaire to demonstrate the physical structure of the perception system of sight in which the optical neurons reverse the images. 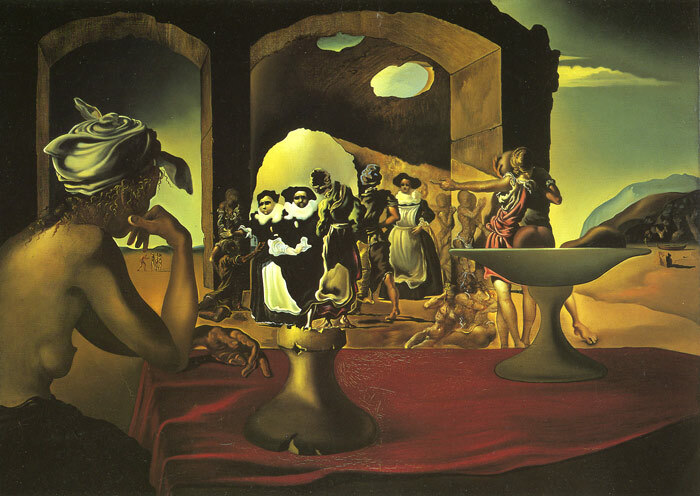 While painting this picture Dali related in Dali de Gala : "I kept reciting without ever stopping the poem of Joan Salvat Papasseit, 'Love and War, the Salt of the Earth.' " Salvat Papasseit was a Catalonian anarchist whom Dali greatly admired. In Barcelona he was accused of having become an extreme rightist because the only thing he did was to apologize for the war at a time when everybody else had become pacifists. SPECIAL NOTE : The painter will make the reproduction as close to the original oil painting as possible. If you want your painting to alter from this likeness, please email us and " Slave Market with the Disappearing Bust of Voltair, 1940 " will be reproduced according to your special requirements.